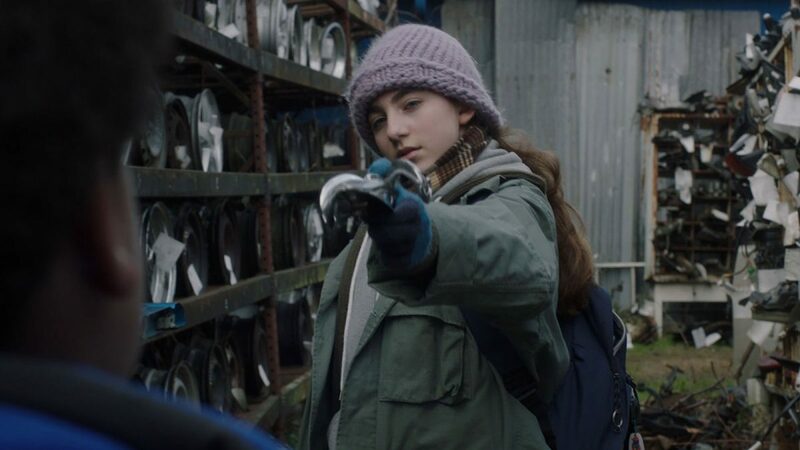 Sadie – an observant and incredibly clever young teenager – desperately misses her father, who is enlisted in the military and just informed her that he will be staying longer for another tour. Her mother, Rae (Melanie Lynskey), has been trying to navigate being a good parent while battling her own loneliness and non-existent marriage. When Cyrus, a well-intentioned man with a painkiller addiction, moves into the neighborhood, he and Rae begin seeing one another, crushing Sadie’s idea of her family reuniting again. Insistent that her father will come back and their lives will be better with him in it, Sadie carefully plots to break up the new relationship, stubbornly refusing to see anyone’s side but her own. Moving within the confined spaces of mobile homes and small rooms, writer and director Megan Griffiths creates a tense and emotionally suffocating space for both Sadie and Rae to connect. Along with the dark and damp setting, the subtle and charged performances by leads Sophia Mitri Schloss and Melanie Lynskey, make their situation even more desperate – this is all that they have. With a supporting cast including Tony Hale, Danielle Brooks, and John Gallagher, Jr., Sadie is as much a coming-of-age story as it is a mother/daughter story about relationships and how they affect each one of us.